Thierry Henry is currently assistant manager to Roberto Martinez with the Belgium national team. 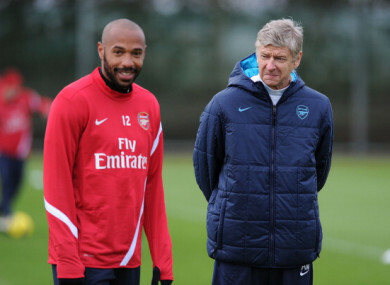 Henry pictured alongside Arsenal boss Arsene Wenger in 2011. THIERRY HENRY HAS said he would not “back down from a challenge” if a vacancy arose to succeed Arsene Wenger as manager of the Gunners. However, Henry is desperate for his under-fire fellow Frenchman to have the “last word” on an Arsenal career that started back when Wenger took charge of the north London club in 1996. Long-running speculation about Wenger’s position at Arsenal intensified after the Gunners suffered a fourth successive defeat in all competitions, a 2-1 Premier League loss away to Brighton, on Sunday — a result that left them a huge 13 points adrift of the top four. Former France forward Henry, currently working as an assistant to Belgium manager Roberto Martinez, was asked on Sky Sports if he would take the Arsenal job should the opportunity arise. Should Arsene Wenger stay at @Arsenal or should he go? “Listen, I’m a competitor, you don’t back down from a challenge,” the 40-year-old replied. “We are hypothetically speaking before people jump ahead of everything, (but) I have never backed down from a challenge since I was young. Having won two Premier League titles and three FA Cups under Wenger, Henry — Arsenal’s all-time record goalscorer — said he was desperate for the veteran manager to decide his own future. “We are talking about shall he quit or not — I can never say that,” Henry explained. “I am not sitting on the fence, I can never say that. Email “Henry ready to step in at Arsenal but wants former boss Wenger to have 'last word'”. Feedback on “Henry ready to step in at Arsenal but wants former boss Wenger to have 'last word'”.